A hands-on guide to building websites and applications in Drupal. This fast-paced tutorial explains, step-by-step, how to build highly functional websites and applications using the popular and powerful open-source software Drupal. Timed for the newest release, Drupal 7, the book helps you get started very quickly while teaching you many of the more advanced capabilities along the way. Drupal: A Beginner’s Guide helps you get your great ideas to the Web at minimal cost and effort. You’ll be able to build a site framework that has total flexibility and slick aesthetics. The book also includes plenty of tips for easy, do-it-yourself website maintenance. About the Author – Ray West is a CIO, programmer and author with over 12 years experience in web development creating database and content management systems. He is the author of numerous books on web development and is the founder of CommunityMX.com and TODCon (The Online Developer’s Conference). Drupal 7 Essential Training shows how to get the most out of Drupal, the content management system (CMS) that powers over a quarter million web sites. The course demonstrates how to download and install Drupal, add content and graphics to a site, change layout and design elements, control visitor interactions, and expand the site’s capabilities beyond what’s available in Drupal core. Discussion of established best practices in each step to ensure that a site remains streamlined, secure, and up-to-date. Exercise files are included with the course. 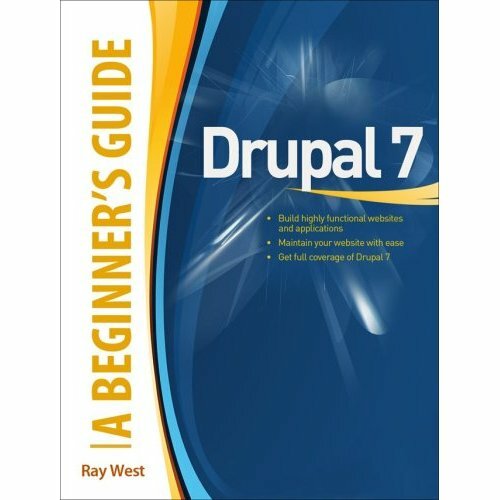 Who this book is written for – Drupal 7 First Look is written for site administrators, themers, and developers who have some experience with Drupal 6 (or even Drupal 5) and want to upgrade their sites, themes, or modules to Drupal 7 or just learn more about Drupal 7. No programming experience is required, but several code examples are covered for readers that want more in-depth information about building themes and modules. About the Author – Mark Noble – Mark Noble has worked in software development and website design for over 13 years in a variety of capacities including development, quality assurance, and management. He takes pride in developing software and websites to make businesses run more effectively and delights in helping users to get their jobs done more easily. Mark currently works developing websites to help libraries manage their books. He also does occasional contract work for clients in a variety of industries. When he isn’t in front of a computer, Mark enjoys playing with his family, photography, and geocaching.